Each year I delve into the bottom of my freezer. I find the odd bits, the cast always, the oh-crap I forgot about that’s. Then I transform those odd bits into something greater – a sausage. They range from the common bratwurst to a Moroccan spiced Merguez sausage with ample chorizo, breakfast and Italian varieties included. The goal is to transform overlooked meat into a special occasion. To more fully utilize the life that was taken for food. Making sausage at home is not a complicated affair but it does require a little bit of an investment. Mixing bowls, a grinder, a stuffer, a scale, a good sharp knife and a little bit of time are the major necessities. If you are lacking anyone of these things, especially time, do not attempt to make the sausages. 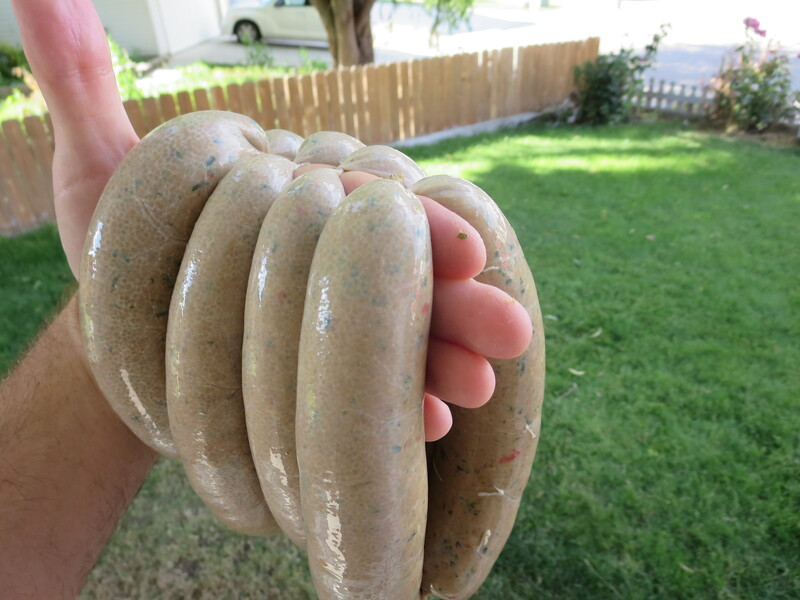 By no means is this article an exhaustive “how too” guide for making sausages. It is confined to fresh sausages – ie not smoked or cured. If you are going to attempt smoked or cured sausage types (and they are awesome) consult a trusted book or website first. As with most things sausages are a process. Below I have laid out the constituent pieces of the sausage making puzzle. Like always the care of all meat is vital. Follow the GIGO principle with sausage – garbage in, garbage out. Basically if you try to stuff crap into a casing it will taste like crap. I use the edible trim, sometimes the shanks, the neck meat, and the odd cuts that don’t make good roasts or steaks. But never do I add the sinew, connective tissue or other trash. If I don’t want to eat it, I do not want it in my sausage. The fat on wild animals is totally edible if not prevalent. But some cite it as having a stronger flavor than the meat itself; often blaming the fat for the “gamey-ness” in the meat. However, off flavors are more often caused by external factors with meat – temperature abuse, how long it took to die, the rut and external contaminants. I often use internal fat for sausage, like the fat around a deer’s kidneys, because it melts better in sausage. Internal fat will have a bit more subtle flavor and will more readily melt than external fat. As a note – external fat on an animal is used for insulation while internal fat is used as fuel. Thus the lower melting point of internal fat. Without fat sausage is just not sausage. In a given year I will use three types of fat in my sausages. Next is pork fat. I buy this for next to nothing from my local grocery store. Any place with a decent butcher shop will sell you pork trim. They like doing it, you will make a good butchers day by chatting him up about this sort of thing. The other fat for me is from Kobe beef. I get this from a friend at Snake River Farms, Chef Alan Turner, and I have never been let down. Kobe and whitetail sausages are just about the best darn thing on the planet in my mind. Regular old beef fat can work but just make sure the quality is high. No need to ruin a bunch of wild game meat by adding the fat from old dairy cow to it. With the fat it is ok to have it be nearly frozen when you start. The Casing – Manny options exist for the sausage casing. Lamb, hog, cow, synthetic and plastic options are all available. Only one casing is really needed – the hog casing. It is the most reliably good casing and will work for most occasions. Read the instructions and follow them. Nothing is worse than trying to stuff a casing that is not fully hydrated or rinsed – this one I know from experience. The Temperature – Keeping it simple – the meat needs to be as cold as possible. Nearly freezing is the best possible option. I like to thaw my meat until I can just cut it with a sharp knife, then I grind it. Be quick and if you have to stop keep the meat in the refrigerator. The Seasoning – By far the most important seasoning ingredient in the sausage making process is salt. Use a ratio for the salt when making sausages – figure 1/3 an ounce of salt per pound of meat. After that ratio the rest is up to you or the recipe you are working with. Some recipes recommend adding the seasoning before the grinding, some recommend it afterword. I typically split the difference and add the salt before the grind and the rest of the seasonings – herbs, garlic, wine ect – after the grind. This way I can make different flavors of sausage without having to clean my grinder. The Grind – Grinding the meat is what starts the sausage process and is what can lead to an increase in temperature. If possible grind the meat into a stainless steel bowl that is sitting on top of ice. This will keep the whole pile of meat as cold as possible. I also freeze my grinder attachments. Speaking of grinders – if you are going to buy one make sure it is of high quality. Nothing is more frustrating than a grinder that cannot keep up, clogs, over heats or is just a cheap POS in the first place. I suffered through this for a few seasons and finally broke down and bought a $300 meat grinder. I have never made a better investment for wild game meat. I typically use the smallest diameter possible on my ground meat. This smaller grind gives the meat a smoother texture and will “take care” of most of the random hunks of sinew and tendon. The Bind – As tacos will tell us ground meat is inherently crumbly. But crumbly is not a desired texture with sausages. The way to avoid this texture issue is by forcefully mixing the ground meat together. This forceful mixing is called the Primary Bind and can be done by hand or in a mixer with a paddle attachment. The mixing and mashing of the ground meat activates the protein myosin, making the meat sticky. That stickiness is what gives you the good sausage texture. Remember to keep the meat cold! If the meat warms up to much in the Primary Bind stage the fat can melt causing it to lose its structure. This can also cause a drying out of sausages. The Stuff – This is more art than science. Take the rinsed casing and get it onto the extruder tube (either on the grinder or on the sausage stuffer). This will be an awkward moment in life, just an FYI. I like to get multiple casings onto the extruder at one time. This lets me make more sausage and not have to constantly add more casing to the extruder. Leave a portion of the casing off the end of the tube; tie this in a knot, then poke a small hole on the machine side of the knot. This will allow built up air in the device to escape and the casing will not have an air pocket. Next allow the meat to extrude into the casing. You want the casing to be full but not as tight as it will get. This will take a little trial and error to figure out. Sausage that is not full enough will be limp and lack that crisp bite. Sausage that is over-stuffed will burst open when cooked letting out all the tasty juices. Getting the perfect stuff is actually a little easier if you have less, you can always twist the links and make them tighter. Next let the meat extrude into the casing, twisting the casing every six inches or so to mark each of the links location. Tie off the end of the casing. Repeat until you have all your meat in a tube. The Cook – Everyone cooks sausages differently. Some boil then grill, some brown then bake, some braise in beer. Whatever the method just remember that direct high heat can cause the casing to split. Remember a temperature is more important than a time. Sausages cooked with venison or red meated birds (goose, duck) need to be cooked to about 150 degrees. Sausages with bear, boar or white meated birds (turkey, chicken) need to be cooked to 160 degrees. Remember that bear meat causes 90% of the trichinosis cases in the country, simply because it is not cooked enough. The Eat – Ditch the bun. Get the knife and fork and eat sausage like a steak. Moroccan Merguez Recipe – This one is by Hank Shaw. Since I can not seem to improve it I will like to it!